This entry was posted on September 25, 2012 by Van Rental. Disclosure: I paid for these tyres myself and have no relationship with the tyre manufacturer or the tyre supplier. Recent winters have seen the UK’s transport infrastructure grind to a halt due to levels of snow that would barely rate a mention elsewhere in northern Europe. One of the reasons for this is undoubtedly our inexperience at dealing with it, because it doesn’t happen that often. However, the other reason is definitely tyre-related: the vast majority of British car and van drivers spend each winter driving around on summer tyres. Summer tyres are cheap and long-lasting, but they are pretty ineffective in winter, thanks to a tread design that can’t grip snow and a rubber compound that becomes stiff and slippery at low temperatures — anything below 7°C, in fact. The problem is that winter tyres are overkill for the majority of UK motorists, and nothing short of a new law is likely to bring them into widespread use, even though they provide far superior grip in the kind of greasy, frosty and cold conditions we get for around one-third of each year. Writing elsewhere, I have strongly advocated the use of all-season tyres, a compromise between summer and winter tyres that are standard fitments to new cars in the USA and are popular elsewhere in Europe for drivers who don’t want to swap tyres twice a year. Recently, I decided that I should put my money where my mouth is and use them myself, to see how they really perform in UK summer and winter conditions. As it happened, all four tyres on my Ford Transit campervan needed replacing at the start of the summer, so I had the perfect opportunity to switch tyre types and try out a set of all-season tyres. All-season tyres use a rubber compound similar to that of a winter tyre that will remain flexible — and grippy — at low temperatures. Unlike winter tyres, however, they have a tread design that is similar to that of a summer tyre, but with the addition of ‘sipes’ — narrow slits in the tyre that fill up with snow and provide extra grip in snowy conditions. The choice of all-season tyres in the UK is limited for cars and vans. However, there are a number of good quality choices available that can be bought through some of the big tyre chains and you can find a much bigger choice online at mytyres.co.uk, the UK branch of German tyre Delticom. This is why it has such a great choice of tyres at good prices — it is a huge business in Germany, a country that takes tyres far more seriously than we do. I bought my tyres from mytyres.co.uk and would recommend it — delivery was fast and the local fitting service was convenient and well priced. I chose the Hankook RA10 based on a mixture of good reviews and competitive pricing — the cost was only a few pounds more than the cost of a set of Goodyear Cargo G26 tyres, which I had previously on my van (and liked). If money was no object, I would probably have had the Contis — but they were nearly £20 per tyre more at the time of my purchase. So there I was, at the beginning of summer, with a brand new set of Hankook RA10 all-season tyres fitted to my vans. 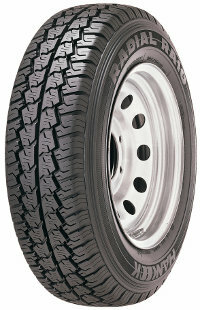 The previous tyres were Goodyear Cargo’s — a popular tyre choice on 2.5t – 3.0t vans and a good quality tyre. How do they compare? I’ve compared them to my previous Goodyears below after a summer of use. Dry grip: Good enough, but not as good as the Goodyear under heavy braking or cornering. Wet grip: Reassuring and very good, especially in standing water. Possibly a little better than the Goodyear, certainly equal. Good on wet grass and mud, too — they carry a M&S (mud and snow) rating. Noise: Slightly noisier than the Goodyear Cargos — not a problem, but definitely noticeable in warm dry conditions. Fuel consumption: No noticeable difference. Wear: Too early to say. As always, keeping them correctly inflated and cornering sensibly will help prolong tyre life. The all-season tyres are not quite as good as summer tyres in summer conditions. However, this is what I expected as a trade off for better grip in winter conditions (not just snow — frost, ice, rain and low surface temperatures, too). Winter is only just approaching and for once, I am looking forward to it and hoping for some cold weather so that I can put the Hankooks to the test. I will update this article and add a second winter review next year, to provide a complete picture of these tyres’ all-season performance! Until then, if you have experience with all-season or winter tyres or would just like to make a comment, then I’d love to hear from you in the comments box below. Note: I’d especially like to hear from anyone who has used winter tyres through the summer, as I have seen British Gas vans doing (in the rural north of England). Pingback: Do You Need Winter Tyres For A European Ski Holiday?